In an effort to curb illegal religious activities and resist overseas forces' infiltration using religion, Northwest China's Ningxia Hui Autonomous Region has explored innovative measures to manage religious affairs, including establishing a democratic system for selecting imams for mosques. 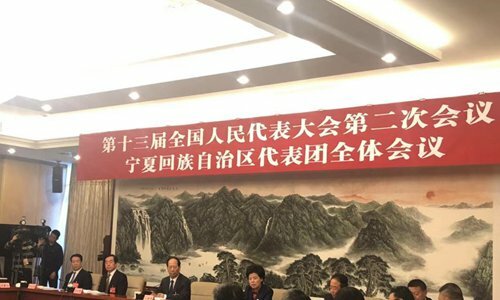 Deputies from Ningxia to the 13th National People's Congress (NPC) held a sideline group meeting on Wednesday morning to discuss the Government Work Report released on Tuesday and talked about their achievements and plans in poverty alleviation, environmental protection and ethnic unity. From the meeting, the Global Times learned that in 2018 Ningxia boosted curbs on extremism and infiltration and cracked down on crimes to safeguard the region's religious stability. Ningxia has around 2.47 million Hui people, accounting for 36 percent of the region's population, and a majority of them believe in Islam, according to official data obtained by the Global Times. The regional government explored some innovative measures in managing mosques. For example, it established a transparent and democratic system for selecting imams and asked mosque personnel to set up financial supervision teams. The regional government also formulated mid- and long-term plans for religious personnel's education and training, especially their high education. Graduate classes for Islamic personnel were held to promote their skills. The classes were co-hosted by the Ningxia Institute of Socialism and the Ningxia Islamic Institute, with the aim of cultivating a group of talents who have mastered basic theoretical knowledge of ethnic religion, understand the Hui nationality and the history and current status of Islam, are able to adhere to the direction of religious Chinese, and resist the penetration of overseas religious thoughts. Jin Rubin, a deputy chairman and spokesman of the China Islamic Association and NPC deputy, hailed Ningxia's progress on the sinicization of Islam. "All the efforts of the Ningxia government could help better manage religious affairs in accordance with laws, improve religious personnel's qualities and promote the assimilation of religion in a socialist society," Jin told the Global Times. The region has 4,391 mosques and 10,150 registered imams, which makes religious staff a significant group to promote patriotism and unity in the region, Jin said in a previous interview. Apart from these measures, national flags were raised in mosques and other religious venues in Ningxia and regional government officials organized religious personnel to study the Chinese Constitution, socialist core values and traditional classical Chinese culture. The moves come after the China Islamic Association issued a letter in May 2018, urging Islamic associations and mosques nationwide to strengthen their "concept of nation" and carry forward "the spirit of patriotism." Ningxia government also strengthened its management on the construction of religious sites, requiring religious activities to be approved and religious faculties registered. Every six months, the regional government launches thorough inspections into hidden problems in the field of religious affairs. In recent years, Ningxia has been the center of controversy over pan-Islam tendencies. The Ningxia government has taken several measures against the pan-halal tendency and Islamic thought influenced by theologies common in Arab nations, which is referred to as Arabization. In March 2018, Ningxia rectified the halal food label by using pinyin instead of Arabic and reconstructing Islamic-style buildings.